This ramble is special for its surprising woodsiness and remoteness. 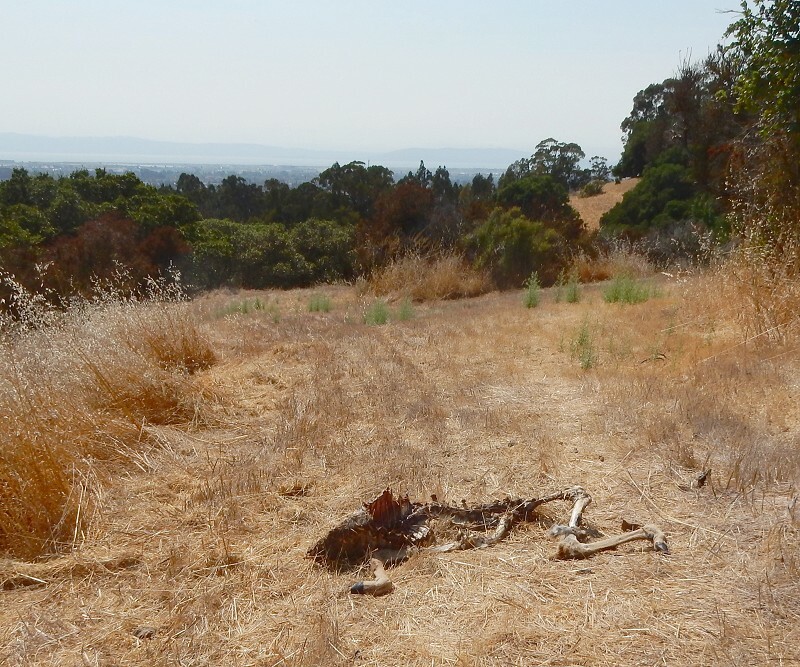 I’ve seen enough deer bones along the way to guess that if any mountain lions live on this side of the hills, this is where they are. This post has been a long time in the making because I wanted to try all the options. The photos are from this summer, when I explored it in earnest. Take the 46 or 46L bus line to the zoo entrance. From there, walk in through the gate and turn left. 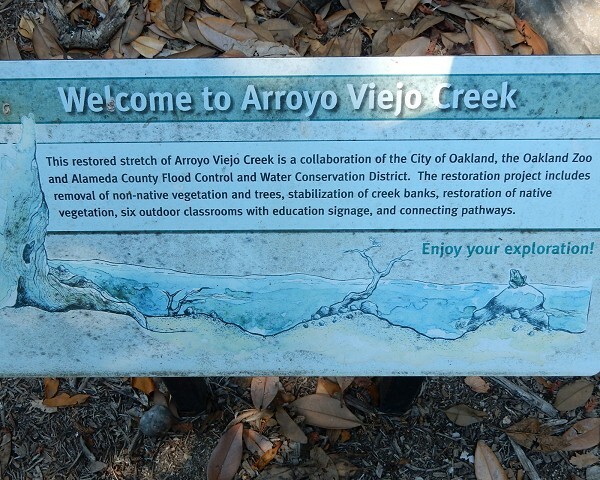 There’s an unsung trail, dotted with seating and signage, that shows off the creek here. The trail crosses the creek and connects with a fire road. 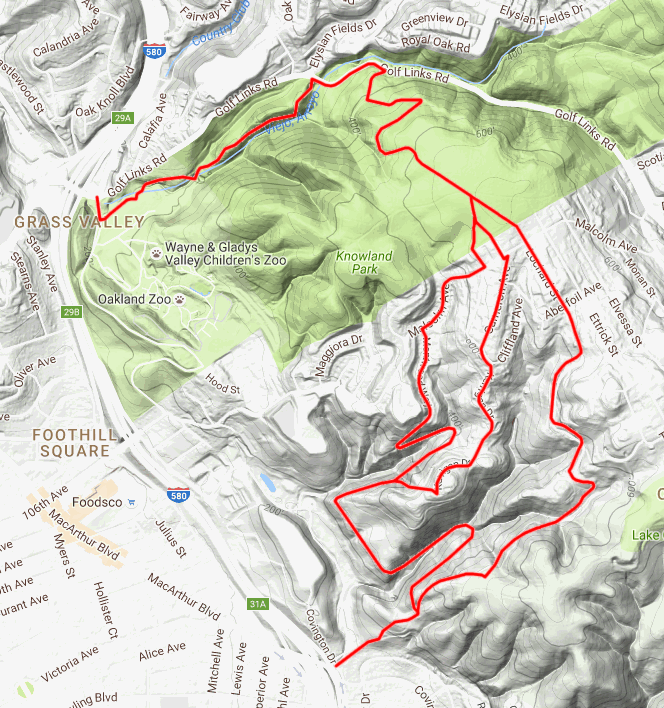 Soon after that, the stream valley splits and you have two routes — the northern one is the fire road, and the other is a tiny trail along the spine of the odd, narrow ridge that runs for about half a mile between the two creeks. I prefer the northern route for its rock exposures and the southern route for its seclusion and its views, like this one of the new zoo facility under construction. The two routes rejoin where Golf Links Road and Elysian Fields Drive meet. 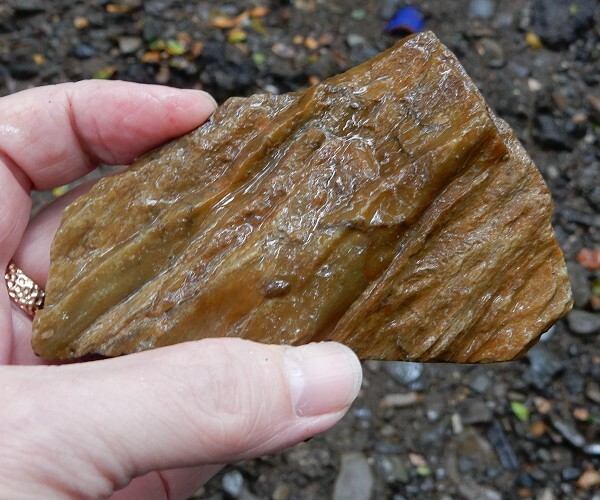 If you like, rummage in the creek bed and examine the fresh-scrubbed rocks of the Knoxville Formation. 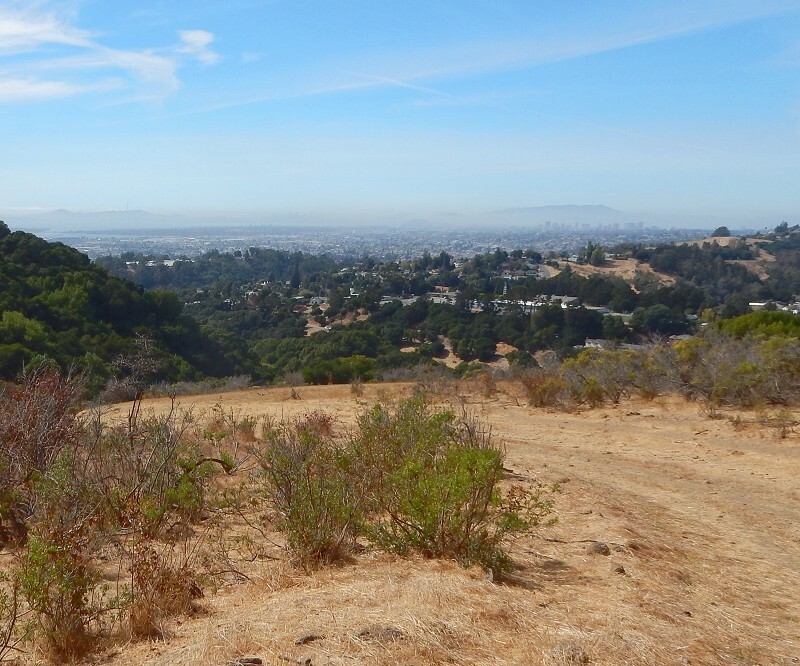 Walk carefully up Golf Links and take the fire road into Knowland Park. This part is steep, but the views open up nicely. And the rocks suddenly change to Franciscan melange. 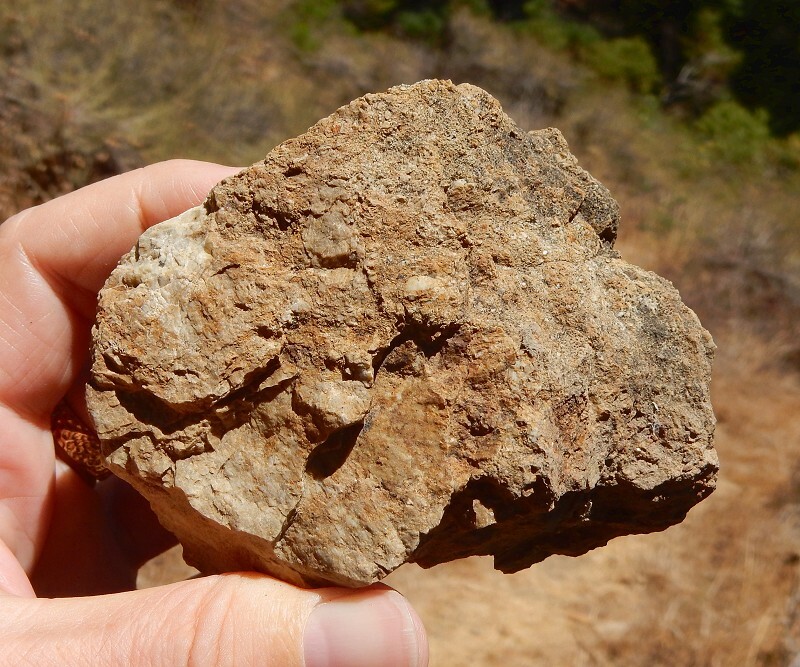 Knowland Park’s rocks are a destination in themselves, as I’ve pointed out here a few times. At the top of the park’s broad, flat crest you have three route choices. The western route slots through Snowdown Avenue, the central route through Cameron Avenue, and the eastern route through Lochard Street. I’ll show them in that order. Please note that off of paved streets, the routes are just rough lines, not precise plots. For the western route, take Malcolm Avenue and then Montwood Way down into the headwaters of the north branch of Upper Elmhurst Creek. The fire road at the end of Montwood takes you into real wildlands. Bear left and head down into the valley. A fresh landslide blocks the fire road and exposes the Leona volcanics. 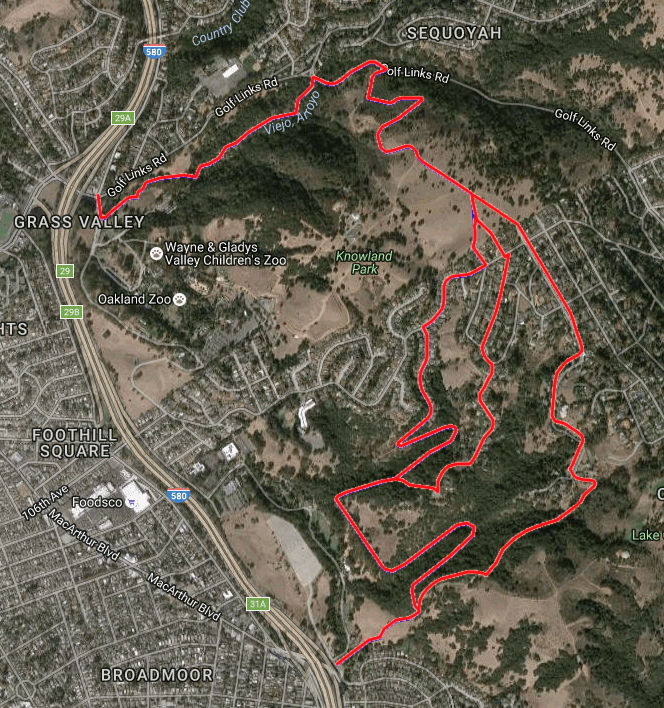 Although I call these fire roads, I think they’re really sewer roads because they all seem to serve sewer lines for the Chabot Park Highlands neighborhood. After you cross the creek and head downsteam, the route gradually climbs out of the stream valley and takes a sharp left at the fence at the top of the Dunsmuir House property. Here it intersects with the middle route. The middle route is picturesque because it follows Kerrigan Drive along the ridge between the two branches of Upper Elmhurst Creek. The ridge ends in a knob that widely visible, as seen here from Lochard Street. At the end of Kerrigan is a fire road leading to the right that goes down to the edge of the Dunsmuir House land and meets the western route. The combined route runs level across a well-formed faceted spur, which reflects the action of the Hayward fault just a hundred meters or so to the west. Then it turns up the valley of the south branch of Upper Elmhurst Creek. This branch should be considered the main stream of the creek, as it runs at a little lower elevation than the north branch. I suspect that the two branches may have drained in separate directions at times in the past. It would be too easy for a landslide along the fault to divert the northern stream to the right — or to the left as it runs today, for that matter. This is dynamic terrain. Both streams are distinctly incised into their beds by up to several meters. 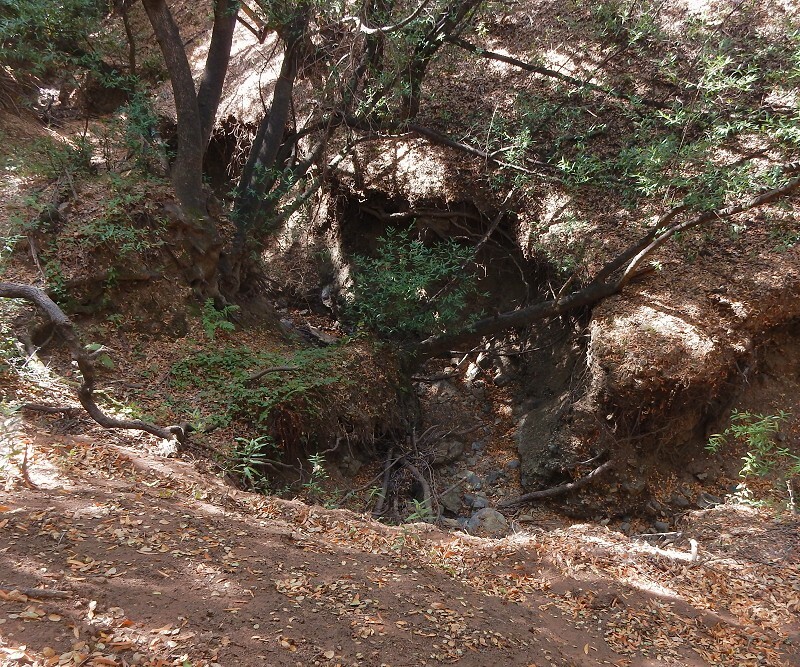 This catches my attention because the hillsides are very steep, steep enough that a strong earthquake would send landslides down and clog long stretches of these streams. The last one of those was in 1868. This is an observation that applies generally to streams in the Oakland hills. The route eventually crosses this creek and turns back west. As it climbs away from the creek it becomes a steep and narrow footpath. In due course you join the eastern route in Dunsmuir Ridge Open Space. I would tell bicyclists not to bother with this particular creek and try the eastern route instead. The eastern route goes down Lochard Street almost to its end, where a fire road cuts off to the left. 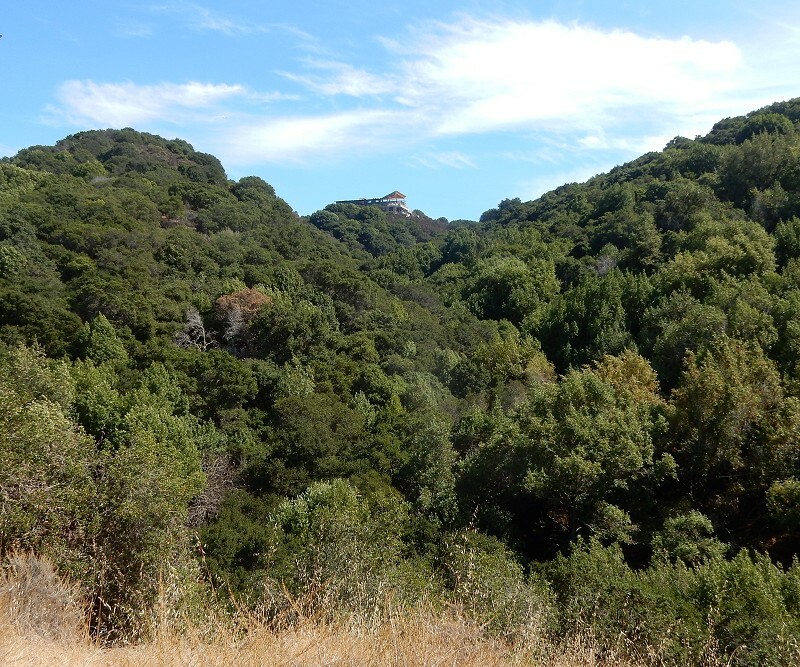 This is a very pleasant stroll through our oak-laurel forest that includes more exposures of Leona volcanics. 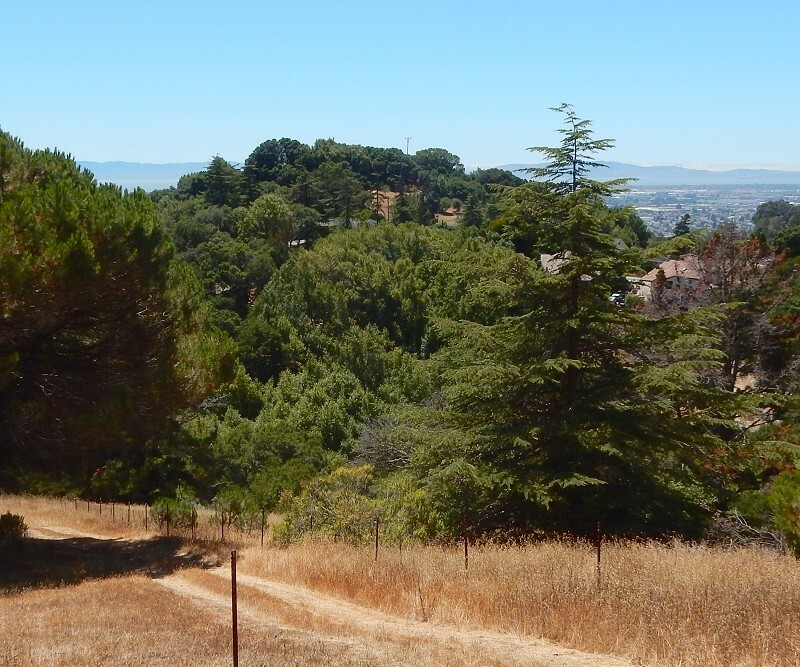 The road leaves the woods in Dunsmuir Ridge Open Space, where the view south overlooking Sheffield Village is completely different from the view west in Knowland Park. From here you head downhill to civilization, taking either the fire road or the footpath through the woods. 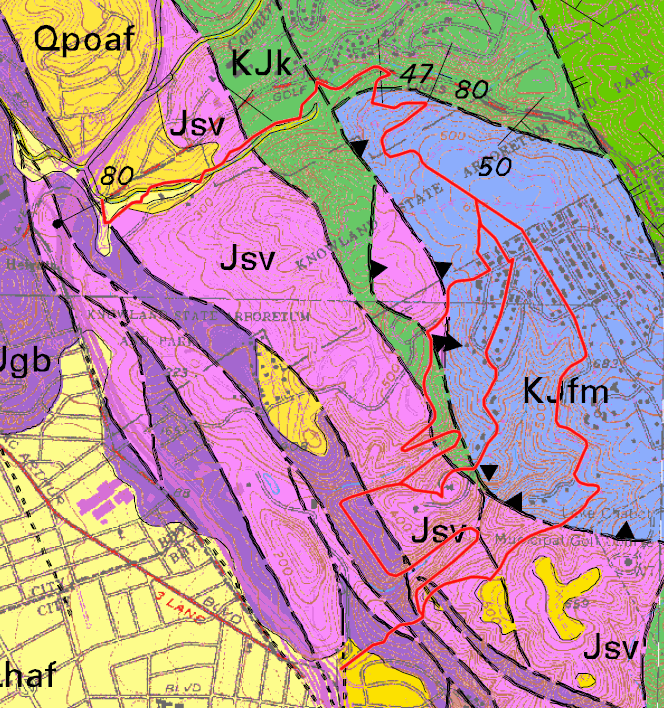 They rejoin where the combined west and central route arrives, right at the trace of the Hayward fault. To meet your public-transit needs, the 75 bus comes through Marlow Drive every hour. 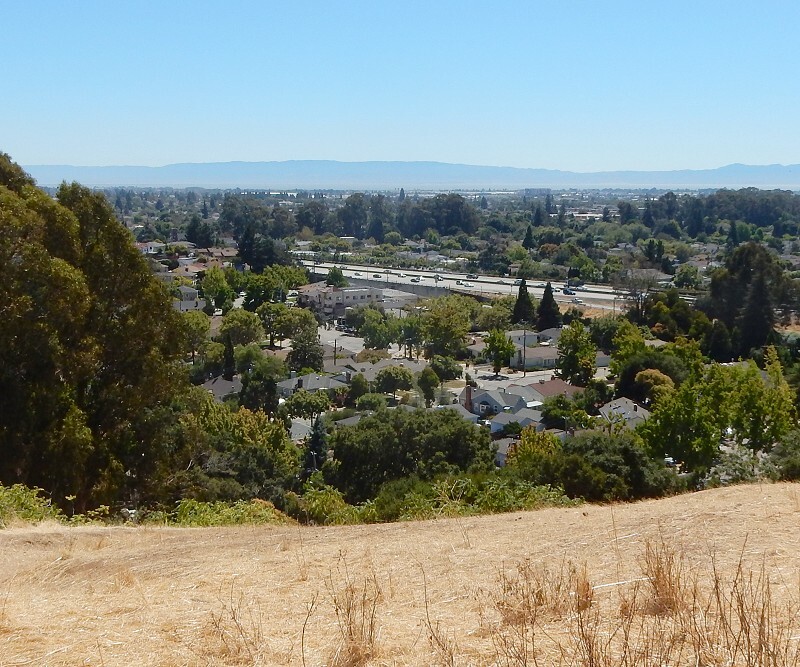 If you miss it, and you usually will, it’s a level walk of 2 miles to the San Leandro BART station or a shorter one to Foothill Square. 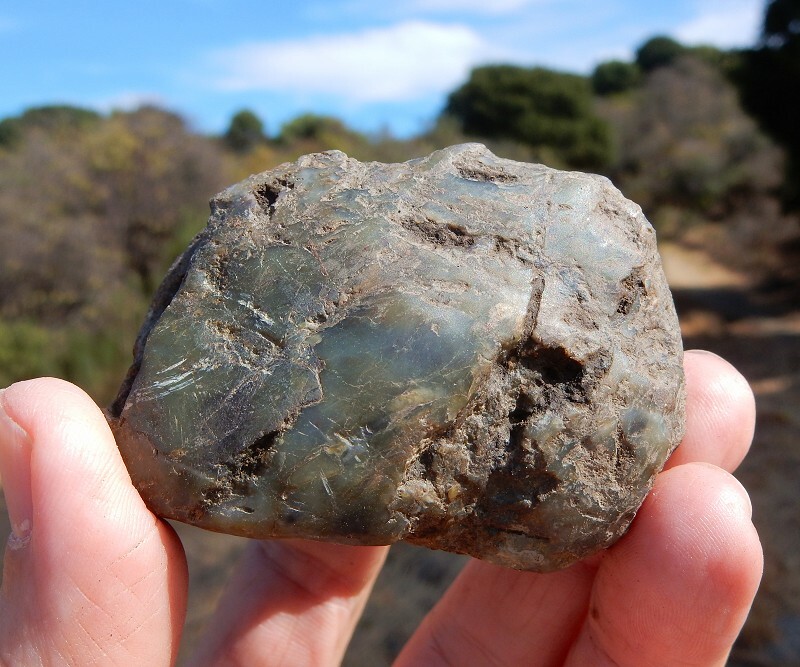 This entry was posted on 7 November 2016 at 8:03 am and is filed under Franciscan rocks, Oakland geology walks, Oakland streams and water. You can follow any responses to this entry through the RSS 2.0 feed. You can skip to the end and leave a response. Pinging is currently not allowed.